Photos of Contest Winner, Listeners, Millikin Quartet, Hap Jensen and Harry Bradford and wife. 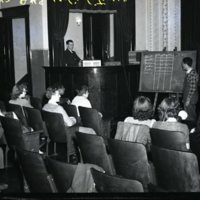 Photo of WSOY Contest Winners, 5/11/1940; Photo of Radio Listeners in the WSOY studio, 3/18/1943; Photo of Millikin University Quartet, Millikin Hour, 5/15/1943. Photo of Harry Bradford and wife, 10/20/1937. Photo of Hap Jensen, 3/31/1957. 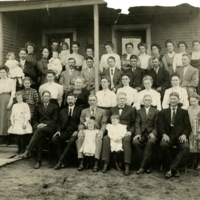 Photograph of the Bear family sitting on porch of a house on April 11, 1910.